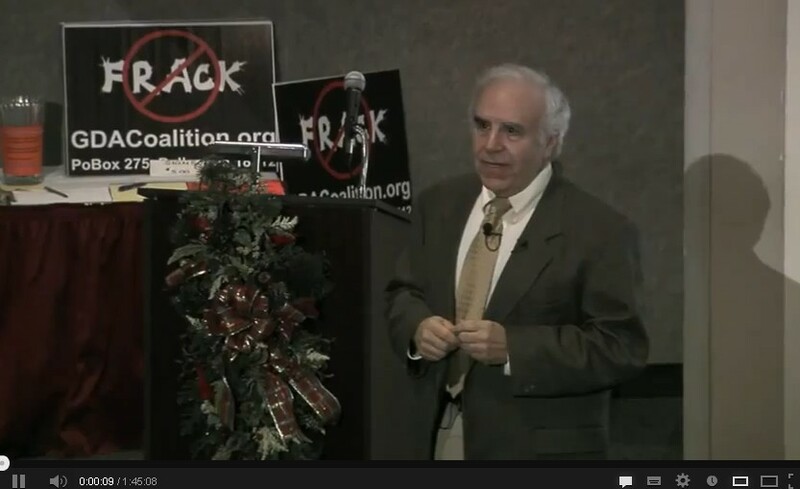 The trial in Dimock over water contamination allegations continued this week as anti-fracking activist and former Cornell professor, Anthony Ingraffea, most known for his debunked studies on methane, took the stand. Ingraffea is often cited by media as an “expert” but his comments on the stand this week show that title isn’t exactly merited. Not only did Ingraffea admit that he is biased against fracking, he also told the courtroom that he has no experience whatsoever with shale development. Q. In fact it goes beyond opposition, does it not, sir? You are self admitted advocate? A. I am a self admitted advocate, yes. Q. Do you recognize yourself in that photograph sir? Q. Okay. Who is the — what is it — my vision is not so great. GDAC coalition dot O.R.G. A. Here in Pennsylvania at an invited presentation, I was giving to a public audience open to the public to lecture on the development of shale gas. It was not an activist meeting it was not meant to have me protest, it was in, I believe, a high school auditorium or college auditorium or library auditorium open to the public it was advertised as me giving a public presentation. Ingraffea goes on to say that the photograph itself was deceptive because “the podium is a long distance away from those frack signs which were inside the door.” So perhaps he really didn’t know that GDAC is a group that is very vocally opposed to fracking. 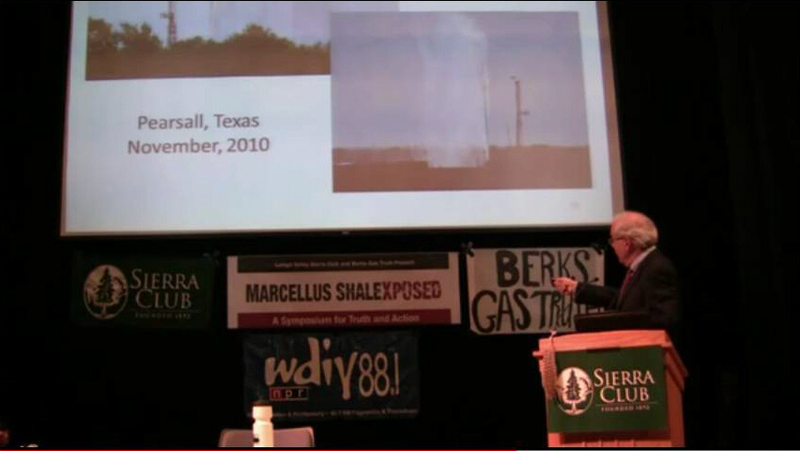 But what about the event Marcellus Shale Exposed back in March 2012 where Ingraffea was the keynote speaker? Interestingly, former Dimock litigants, Craig and Julie Sautner, were headlining the event as well. Activists, organizers, and researchers from environmental and social organizations will join the speakers in leading the afternoon task forces. Adam Garber of PennEnvironment, Thomas Au of the Pennsylvania Sierra Club, Iris Marie Bloom of Protecting Our Waters, Michael Wood of the Pennsylvania Budget and Policy Center, Jay Sweeney of the Green Party of Pennsylvania, Matt Walker of the Clean Air Coalition, Wendi Taylor of the Pennsylvania Sierra Club, Julie Edgar of Lehigh Valley Gas Truth, Dennis Winters of the Pennsylvania Sierra Club and Wayne Kenton also of the Pennsylvania Sierra Club are among the leaders. Organizations exhibiting at the event include the Pennsylvania League of Women Voters, the United Sludge-Free Alliance, Berks Gas Truth, Green Party of Pennsylvania, Lenape Nation of Pennsylvania, PennEnvironment, Pipeline Safety Coalition, and the Orphaned Wells Project. Q. And, you have appeared before a number of organizations across the country. Do you remember appearing in Colorado for an organization called Fracking Sense? Q. And, I asked you about that in the deposition and you recently reviewed your testimony. You remember that, correct? Q. Now you’re retired, but a professor emeritus, correct? Q. Now, I heard you try to compare yourself or contrast yourself with our expert Dr. Hilbert earlier this morning. The ladies and gentlemen will recall that. I think I heard you say that, after acknowledging you’re not a licensed petroleum engineer, that he is not one either; is that correct? Q. Would it surprise you to know that’s wrong? A. He’s a licensed petroleum engineer. What I said is he doesn’t have a degree in petroleum engineering, which he does not. Q. A licensed petroleum engineer? Q. None. How many cement jobs have you actually participated in designing or conducting? A. In an actual well as opposed experimental well, none. Q. I’m talking a real world here actual well, okay. None. Correct? Q. Have you performed integrity or pressure testing of an oil or gas well? A. No…some distance away from a pad where fracking was occurring. Q. What personal experience do you have with plugging or cementing an oil or gas well? In other words, his only experience with shale development was a project he worked on for one year over 30 years ago where he sat behind a computer using the technology available in the early 1980s that resulted in his belief that fracturing shale would be an impossible task. The actual technology and perfection of this process didn’t occur until 2004 in the Marcellus Shale, 20 years after Ingraffea had ceased to be a part of the research. So let’s recap: Dr. Ingraffea has openly admitted his work is biased and advocacy laced, and now has admitted that despite discussing well integrity and fracking every chance he can get, he’s never actually been a part of anything that would give him real world experience to be an authority on those topics. Any experience he has was short-lived and took place decades before the technology was perfected. Isn’t it time reporters stopped referring to him as an “expert”?